When to hang hummingbird feeders in the spring is a question often asked. As far as we are concerned the arrival of the hummingbirds in the spring after the long, arduous migration seems like a miracle. We first recommend that you estimate their arrival by looking at our migration page. There you will find a map of the average dates of their arrival by areas of the U.S. and Canada and a table of the average arrival dates by state. We compiled this table from years of past sightings submitted by our visitors. We strongly encourage everyone to submit their sightings each year to our Migration Sightings and Map page. This will help others to look at the data to determine an estimated arrival date of our feathered friends. After you have the estimated arrival date, we suggest hanging your feeders two(2) weeks before the estimated arrival date. It has been documented that in some years hummingbirds have returned earlier than years past. "When to hang hummingbird feeders". 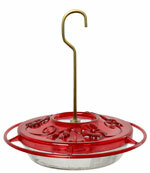 If you are new to attracting hummingbirds with feeders, timing will matter. Hummingbirds will spot your feeder if they are nearby or as they pass on the migration route. If your feeders are not present, the hummingbirds might pass you by. 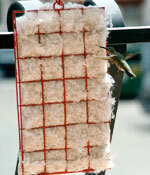 If you would like to learn more about attracting hummingbirds with feeders, please read this. Hummingbirds do have a fantastic memory and will return to the same feeder every year. If these feeders are not out, the hummingbirds may leave to look somewhere else and never return. It’s true that our little friends come back to us loyally but they cannot live more than hours without nectar. Some years the hummingbirds arrive before the nectar supplying flowers are in bloom. So you are ensuring a reliable nectar source that does not depend on weather. If cold weather continues the hummingbirds can use the hibernation like state called torpor to conserve vital energy. Bring your feeders in at night and put them out early in the morning if the temperature continues below freezing. Feeder maintenance in the spring!! You can fill your feeders ½ full at this time of year. Why waste nectar? If you are new to feeding hummingbirds, you might think you need to buy commercial nectar. One problem with this nectar is that it often contains red dye that can be harmful to the birds. There is a commercial nectar that does not contain red dye. We sell it in our store here. You can easily make your own nectar. This is the recipe that Jim and I use. When you hang hummingbird feeders you will need to change the nectar and clean the feeders every 3 to 5 days just as any other time of year to prevent the unused sugar/water mix from spoiling. You will not see hummingbirds at a feeder with spoiled nectar. This is very, very important. We consistently receive emails wondering why their hummingbirds have left. Usually, the reason is that fact that they did not change the nectar often enough, allowing it to "spoil" and they did not keep their feeders clean. Some feeders make cleaning easy. 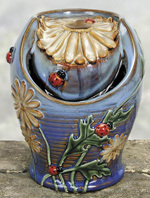 Please read our information about the different types of hummingbird feeders. Special brushes made for hummingbird feeders are helpful too. For detailed cleaning instructions click here. Since Jim and I live in the Northern most part of the northeastern United States, our anticipation for the return of our Ruby-throated hummingbirds comes mingled with our concern over their survival. We understand that the hummingbirds have an extra-long migration to our backyard. Yet, even though we don’t expect to see them until mid-May, there are other locations with later arrivals. The Rufous hummingbirds from Alaska won’t arrive until June. Several species don’t arrive in some Canadian Providences until June. 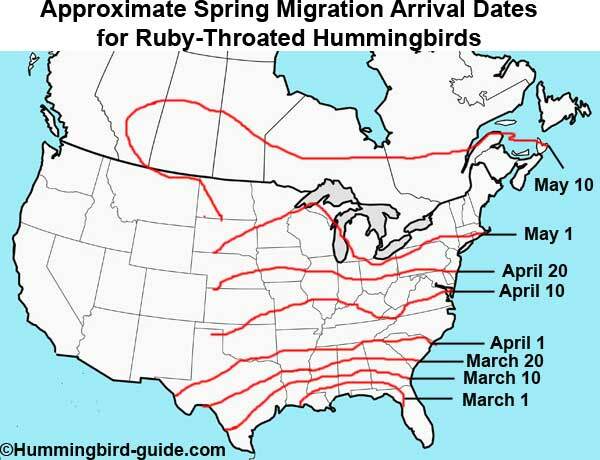 Please note that not all hummingbirds are migratory. If you live in the southern or southwestern regions of the United States some species of hummingbirds such as the Anna’s can be year-round. So anytime can be a good time to put up a feeder if you live is these areas. 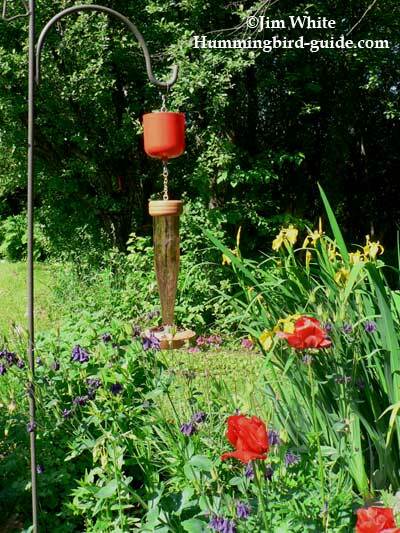 So, our answer to the question "When to Hang Hummingbird Feeders" is simple.... EARLY. 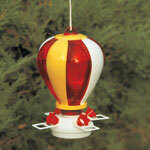 Hang hummingbird feeders early and rest assured that the very first passing hummingbird will have a good meal.